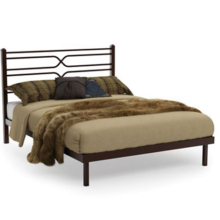 The combination of rustic wood set off with exposed bolts hits the mark in our Dunhill Bed. Inspired by the warm look of larch wood, we added a soft touch with an inviting upholstered panel. 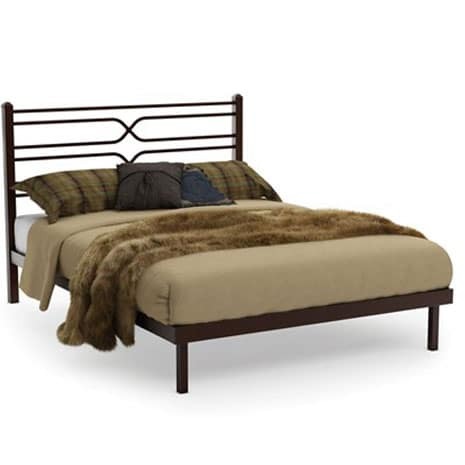 This is a bed that defies industrial style to add oomph to your décor. Choose from a wide selection of fabrics and metal finishes for a custom look. Chic and sophisticated, our Gastown Bed, with an upholstered headboard, brings a new level of cushioned comfort to the bedroom, with an invitation to idle in style. This revisited design has an urban accent that set just the right tone. Need a nest that doesn’t sacrifice on style? This model is your ticket. Customize the look with your choice of nailhead finishes and fabric colors. Picture yourself under the covers with your head in the clouds. The soft and clean lines of this Cumulus Bed inspire coziness and discretion. It has just what it takes to seduce you, plus it fits your décor in a fabulous way. Let the delicate comfort of this bed take you to cloud nine! Choose from a wide range of fabrics to customize the look. Radiant beauty and velvety comfort with just the right feminine flourishes. Starting with the tufted headboard and its subtle hourglass silhouette, this Crocus Bed evokes boudoir glamour down to the last detail. A space where pillow talk comes easy and morning comes too soon. Customize with your choice from many fabrics. With furniture featuring clean lines, neutral hues, and raw materials, industrial style is known for being minimalist and rugged. But does that mean this style has to be cold? Our Dover Bed, with this warm wood headboard accented with metal hardware, dispels any doubts on that score! Customize the look with your choice from several wood and metal finishes. A commanding nailhead headboard makes this Elegance Bed both handsome and inviting, with stage presence to spare. Generously proportioned to give your bedroom just the right touch of grandeur and elegance, it’s all you need to create the boudoir ambience you’re looking for. Choose from a wide variety of fabrics, and there are two nailhead finishes also to choose from. As the place that belongs to you alone, the bedroom should remain your true haven of tranquility. A calm, comfortable refuge where you can relax as you slip into blissful sleep. As the focal point of this special place, your bed must set the tone when it comes to décor. Customize the look of our Gabriel bed by choosing either a high or low footboard, and then choose a metal finish that best suits your style. Industrial style has such character! And it looks great anywhere—even in the inner sanctum of the bedroom. Materials in distressed finishes really set off this Factory Bed. After all, true beauty isn’t about perfection, right? 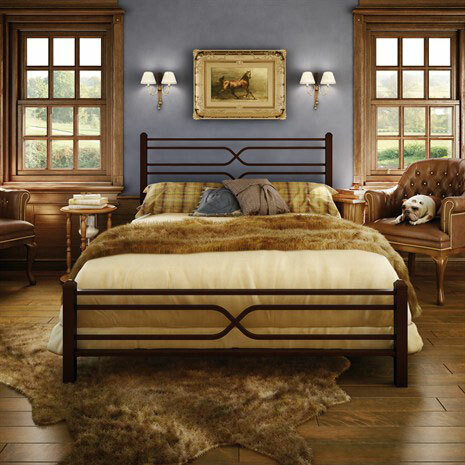 You’ll love the metal strap accents on the headboard panel, too! Choose from several larch wood finishes as well as many metal finishes to best suit your style. The Asher Bed is a great addition to a modern bedroom with its sleek panel headboard and tall pencil legs. Offered in Full, Queen, King, and California King. Choose either American Cherry or American walnut for the wood finish. Pair with other items from the Asher Collection for a cohesive look. The boudoir mood. You’re a modern-day princess, and this is your refuge. Sophisticated curves. A stand-out silhouette. Style and comfort worthy of royalty. Completely cozy. For absolutely blissful lounging. Here, in your storybook setting! 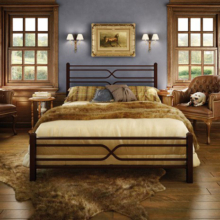 Customize your Cleapatra Bed with your choice of many metal finishes and fabrics for the curved headboard.